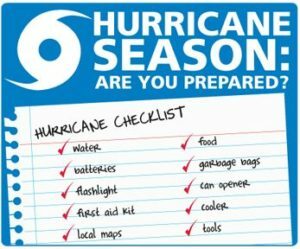 Hurricane season officially starts on June 1 and we’d like to take what we learned last year to help prepare our clients and neighbors with some hurricane advice. St. Croix homeowners should make sure you have all necessary supplies stored well in advance so that the days leading up to a storm can be spent preparing your home and property. The U.S. Virgin Islands Territorial Emergency Management Agency (VITEMA) and Federal Emergency Management Agency (FEMA) are hosting the 2018 Disaster Preparedness and Mitigation Expo on Saturday, May 19, from 10 a.m. to 4 p.m., at the Sunny Isle Amphitheater on St. Croix. The expo is an educational event designed to promote disaster resiliency, weather awareness, safety and hurricane preparedness to residents and visitors of the territory. Most hurricane preparedness resources will suggest having a three-day supply of food; however, based on our experience with island living, we recommend a minimum of seven days. The same goes for drinking water. Last year, as we prepared for Irma and Maria, grocery stores had plenty of food and water available in the days leading up to the storms, though it may be wise not to count on that. After the storm, stores opened swiftly, though we advise that if you prepare with the provisions you need now, then you may not need to shop in those days immediately following. Consider stocking up on the types of food that you would normally eat. For instance, if you usually eat organic, don’t buy ramen. Or if you typically have a protein-based diet, don’t stock up on vegetarian soups. In the event of a major storm, you will want to feel as normal as possible and eating foods that are similar to those you’re used to can help with that. And if we are fortunate to not have any storms, you will have food in your cabinets that you will eat anyway. Don’t forget to pick up some comfort food items to get you through stressful times. If you have an electric stove, you might want to invest in a small grill or camp stove for cooking without power. And don’t forget a manual can opener if you stock up on canned goods! We all think about stocking up on clean, fresh drinking water, but what about water for other daily activities? Kristi recommends filling your bathtub with water before the storm for flushing toilets and other uses. She also invested in a solar shower bag last year and found it to be very useful during the time she was without power at home. While many stores opened after Irma and Maria, don’t assume that supplies will be available. Get them now. A spare gas can will come in handy for getting fuel for your generator. A battery-powered or solar radio will be a lifeline for information, guidance and even entertainment. A battery-powered fan will provide comfort on hot days and nights. Extra batteries are a must. An external phone charger will be helpful — and if it’s solar, even better! Ordering emergency supplies online after the fact is not a viable option and you may only have five or so days prior to a storm to get what you need. Have an inventory of at least one-month-worth of any necessity that you typically order online. Having a tarp or plastic sheeting could help save you and your belongings from disaster. Again, this is something that you don’t want to have to seek out after-the-fact. And, if you don’t need it yourself, you may be able to help someone else who does. There are a few other random things that you might not think of while preparing for a hurricane. For instance, have all of your personal documents (passport, birth certificate, social security card, etc.) in a waterproof bag in a place that is easy to access in the case that you need to make a hasty exit. In addition to pertinent paperwork, you might plan to put irreplaceable items, like family photos and special artwork, in plastic bags. A good storage place for these items is your dishwasher since it is made to be water tight. A dry bag, found at outdoor recreation stores, is also a good thing to have for storing important items and/or clothing. Be sure to fill your prescription medications in advance. Depending on your medical needs, it may be smart to have anywhere from one to four weeks-worth in supply just in case the pharmacy is affected by the storm. Steph suggests keeping your shoes on throughout a hurricane in the event that you need to evacuate or for safety if your floors become wet.